Did you know that Carpet Cleaning has important Health Benefits for your family in Birmingham, AL? Most of us like to keep our home clean as it looks good and it makes us feel good. And, keeping your home clean reflects your personality as well as your lifestyle. One area that makes a big impact on the cleanliness of your home is you carpet. As well as improving the appearance of your home, having your carpet cleaned will also extend the life of your carpet. But, even though these are important reason to have your carpets cleaned, here are 3 even more important reasons to have your carpets regularly cleaned. All 3 of these reasons relate to the health benefits of carpet cleaning. The most valuable benefit from having your carpets cleaned is that it can help improve you and your family’s health. Here are 3 Reasons Carpet Cleaning will benefit your Family’s Health. 1. Carpet Cleaning Eliminates Trapped Pollutants: All sort of pollutants can get trapped in your carpets. Some of these indoor air pollutants include pet dander, cockroach allergens, lead, particle pollution, and everyday dirt and dust. And according to the E.P.A., toxic airborne gases can also adhere to these particles and get trapped within the carpet. Merely walking across your carpet, can cause these toxic gases to be released into the air of your home, and even vacuuming which helps remove dust and dirt can also release these contaminates into your air. Therefore, it is important to have your carpet professionally cleaned at least once a year. Heaven’s Best Carpet Cleaning can help with this. We have the best commercial vacuum in the industry as well as specialized cleaning solutions and equipment to remove these deeply trapped pollutants. 2. Carpet Cleaning Minimizes Pollutants Caused By Dust Mites: You can’t get rid of dust mites, but you can improve you indoor air quality by removing their waste products. Heaven’s Best cleans carpets and upholstery, and removes dust mite waste as well as making your carpet & upholstery look and smell amazing. 3. Carpet Cleaning Reduces Mold Spores: Liquid spills, such as milk, Kool aid, fruit juice, water, beer, and wine can turn your carpets into a breeding ground for mold. 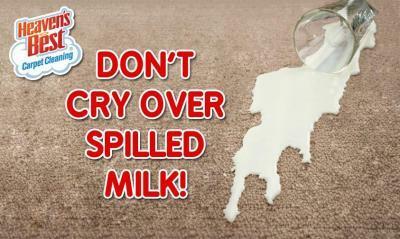 Don't cry over spilled milk! Heaven's Best Carpet & Upholstery Cleaning is here to help! Our thorough carpet cleaning will make your carpets sanitary for you and your family, and our process is low moisture, so your carpets will dry in about an hour. Don’t wait any longer to have your carpet cleaned, call Heaven’s Best Carpet Cleaning today at (205) 618-9150. We will make your carpets look and smell clean and it will benefit your family’s health. Don’t avoid these important Carpet Cleaning Health Benefits any longer in Birmingham, AL.